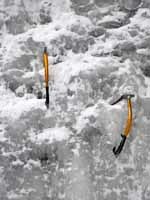 Ice Climbing --- 2/12/2010 --- ??? Guy and I may or may not have been scouting somewhere. We might have toproped something to warm up. Then Guy might have led a WI2+. Maybe we would have pulled the rope so I could pinkpoint it. I would have just TRed the climb, but rope drag made the belay difficult. Then I led my first ever WI3. Of course, I mean that I might have led it, had we even be climbing, which we might not have been. Then Guy might have led the same climb.